Are you a local business owner who is eager to get into the SEO game? Good for you! Establishing a local online presence is definitely a great way to grow your business. Google Places for Business is the perfect place to start your SEO campaign — by establishing your business’ identity on Google Places, it can show up in Google searches, Google Maps and Google+ Local. If you’re in need of Google Places help, you’ve come to the right place — the following guide will help you create your local presence. Create an account on Google Places for Business and list your business’ name, address and phone number — or N.A.P. It’s free and effective! 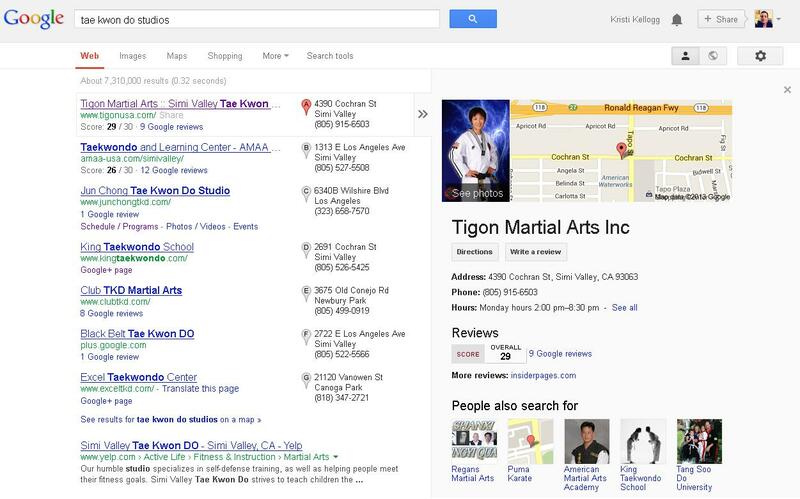 Within Google Places for Business, an owner can add his business address, phone number, business category and more. Name: Google Quality Guidelines dictate that your business name is “exactly as it appears in the offline world.” Therefore, do not attempt to add anything else (such as keywords, marketing taglines, phone numbers, websites, etc.). Address: There can only be one entry per address. You must adhere to the same rules as those in the business name, i.e., no extraneous information. Phone Number: Google prefers businesses use a land line as opposed to a cell phone whenever possible. After you input this data, Google will then send a postcard to the business address within two weeks. The postcard will contain a pin number that will allow you to verify you are the owner. Once you log back into your Google Places for Business account and provide the pin, your business will show up in the Local results. In addition to your N.A.P., you can also include photos, business hours and a description (up to 4,200 characters) wherein you can link to your own site. Learn more about the Google Places for Business Quality Guidelines here. Google Places Help: What If Your Business Isn’t Operated Out of One Location? 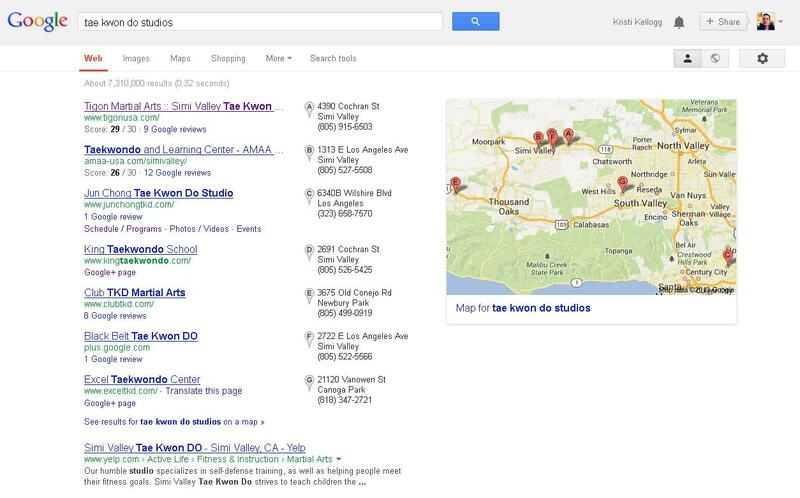 These local results are populated by business with entries in Google Places. Help your business show up by optimizing your own Google Places for Business account. Whether your results show up in the Display Carousel or in the standard Local 7-pack, business owners have the option to optimize even further. Through Business Photos, you can create a 360-degree interactive tour of your location. Though there is no fee for implementing panoramic viewing in your Google listing, you are required to use a Google-approved photographer, whom you will have to pay standard photography rates. The most important place to establish your business’ identity is in Google Places for Business. However, you should also establish your identity on any other notable web directories. As you begin to spread information about your business across the Internet, is absolutely essentially that you be consistent. Your business name should always appear exactly the same, as should your address and phone number. Bruce Clay has a service that streamlines this process. Through LocalPack, our team can ensure your business information renders accurately in more than 350 directories across the web, including Google Places for Business, the Yahoo! directory; the Yellow Pages; 411 assistance directories and much more. Creating your Google Places for Business entry and have a question? Share it with us the comments, and we’ll be happy to provide any Google Places help! Kristi, this is some really great advice! It is so important for businesses to understand the importance of the NAP signature. It is also vital for them to know to keep it consistent! Yes, Google Places can turn into a double edge sword quickly. However, there are some actions that can be done on the business side to help repair the negative feedback. Social feedback should always remain transparent, no matter what the complaint is about. If you see a complaint, be proactive about it. The customer is always right. Find out what happened and resolve the issue, so it doesn’t happen again. The customer can always follow up on their review and post that your company stepped up to fix the issue. High engagement is important when participating in reviews and social media. Feedback can’t sit for days, only hours can go by when responding. Customers are quick to post negative feedback, but positive feedback can be encouraged through follow up order emails. If a customer checks out on your site or completes an order at your business, ask for feedback on your Google Places site, Yelp, and other social outlets. Innovating ways for users to engage on your social review profiles with positive feedback can easily outweigh the negative feedback. This discussion can go deeper, but this should be a start to help correct the negative feedback issues. Google Places has proved to be a dangerous place for our company, unfortunately, the only times we hear back any feedback from our customers is when there is negative comments and it became an eye sore on our Google places page. If only people with positive comments were inclined to post as mush as the negatives it would have been a great place to promote our brand. We ended up removing our company completely which then effected our rankings. Double edged sword. This is great advice. I implemented this last week and already see our business in the search results! That’s awesome. Thanks again for helping the dummies! I have been working hard at optimizing not only my google places page, following every suggestion in this post, but also optimizing me website. Unfortunately, I’m still being outranked by several competitors on the 7 pack for several key words. Many of their profiles haven’t even been claimed yet, and most of their websites are junk. I don’t understand why I’m not getting any results from all my effort, and how these other sites, who haven’t done much, or anything, can continue to beat me in the search results. Any thoughts? It would not help to alter the address in any way, including changing a P.O. box to a suite number. Google wants to represent businesses as accurately as possible and this would be in clear violation of their policies. Furthermore, chances are you most likely won’t even be able to misrepresent your address, as Google verifies addresses (and therefore, Google would most likely know that the post office address is, in fact, the post office, and not your brick-and-mortar business). Thanks for the article, exactly what I was looking for. If someone has a PO box, would it help to write the address as a suite number? Address of post office, suite number, city, state, zip. Would that work? 1. You mostly covered it, but it should be clarified: if your business has a physical street address but can only receive mail at a PO Box, you are ALSO not eligible for verification, as Google doesn’t allow you to set a separate mail verification address and street address. Unfair in many cases for businesses who are units in a shopping strip and have a POB, but that’s how Google operates. 2. Google Places, specifically, is being swiftly deprecated. It’s being replaced by Google+ Local Pages, which function as Google+ Pages (similar to Facebook Pages) but also display on Google Maps like traditional listings. They have to be managed through http://plus.google.com under the Pages area. Right now in terms of flexibility and quality of content, G+ Local Pages are vastly superior, but they are actually the ones that deny PO Box verification — if you register your listing through the older Google Places (http://www.google.com/business/placesforbusiness/) it should still accept PO Box addresses. For a visual, here’s two examples. I’m constantly amazed at the number of my clients who don’t see the importance of using Google Places. It’s free, why wouldn’t you use it? The first results that appear for a local search within Google are the local profiles. It takes up most of the space above the fold. It’s essential to have a presence here. I admit this that Google place is very good option. There is to easy to find the company place through Google places. Great information and a really good guide for any firs timer to follow when setting up as it is easy to make mistake if you don’t know how, nice post, thanks. Great advice, better still it only takes less than hour to do properly. Thanks for the explanation. One thing I am not sure about is whether having a google places listing helps at all if the keyword search includes a placename. Also is the places search limited to the 7-pack rather than a normal listing. 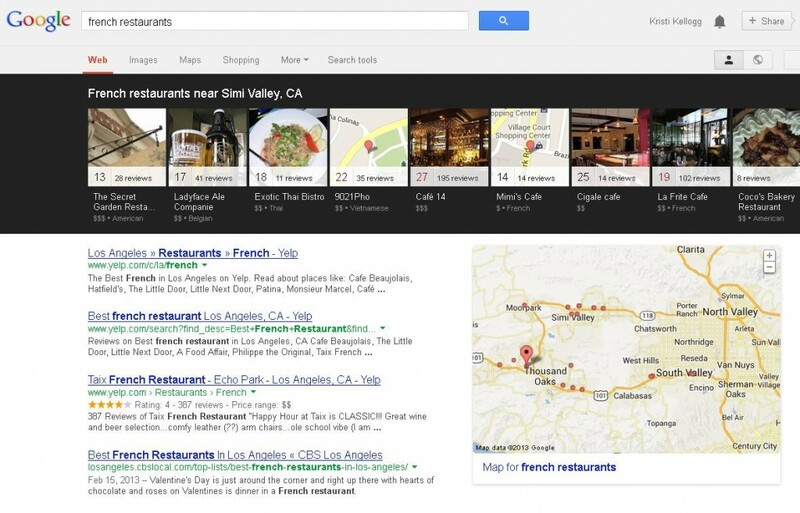 So from your article if I was a french restaurant in Las Vegas I would expect to be picked up by a local 7-pack search for the phrase “french restaurant” if my browser location was Las Vegas. However if I typed “french restaurant Lag Vegas” and there was no local 7-pack shown – just the normal listing – would my google places listing make any difference or would it be based on national rankings for the phrase?